Chapter headings: Introduction. The Reactions Leading to Furfural. Acid Catalysis. The Kinetics of Pentose Formation from Pentosan. The Kinetics of Xylose Disappearance. Furfural Loss Reactions. The "Paradox" of Furfural Yields. The Discoloration of Furfural. Raw Materials. Furfural Processes. Distillation of Furfural. In-line Measurement of Furfural. Treatment of Furfural Waste Water. Applications of Furfural. Carboxylic Acids. Diacetyl and 2,3-Pentanedione. Furfuryl Alcohol. Furan. Furoic acid. Difurfural (5,5'-Diformyl-2,2'-Difuran). 2-Hydroxyfuranone-5. Acetoin. Pyrazines. Tetrahydrofuran. Polytetrahydrofuran. Xylose. Furan Dialdehyde. Furan Resins. Tetrahydrofurfuryl Alcohol. Dihydropyran. Maleic Acid. Methylfuran. Pyrolysis of Furfural. Appendices. Properties of Furfural. Properties of Furfuryl Alcohol. Properties of Furan. Properties of Tetrahydrofuran. Properties of Diacetyl. Properties of 2,3-Pentanedione. Properties of Acetoin. Properties of Acetic Acid. Properties of Formic Acid. Properties of Difurfural. Properties of Xylose. Properties of Tetrahydrofurfuryl Alcohol. Properties of Dihydropyran. Properties of Furoic Acid. Properties of Methylfuran. Properties of 5-Methyl Furfural. Properties of 2-Furyl Methyl Ketone. Properties of Furan Dialdehyde. Explosion Limits in Air at 760 mm Hg and 20°C. Spectroscopic Polarity. Pentosan Determination. Methyl Pentosan Determination. The Entropy Effect in Furfural Loss Reactions. The "Temperature Compensation" of Acidity. The Corrosion Debacle in Extracting Furfural with Chloroform. Corrosion in the Extractive Distillation of Diacetyl. Corrosion in the Extraction of Acetic Acid and Formic Acid. Neutralization of Raw Furfural. Distillation Measures Against the Acidity of Raw Furfural. Flashing of Residues. Operational Details of the QUAKER OATS Batch Process. Operational Details of the ROSENLEW Process. Operational Details of a ROSENLEW Distillation. Acidity Conversion Chart. Extraction of Vegetable Oils with Furfural. Furoyl Chloride. Furfural as a Solvent. The Resinification Loss in Furfural Reactors. The Condensation Loss in Furfural Reactors. Odd Applications. Epilogue. Subject index. 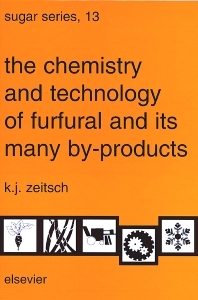 This book is a "world first", since the furfural industry has been traditionally secretive to the point of appearing shrouded in clouds of mystery. Even renowned encyclopedic works have published but scant and often erroneous information on the subject. Striking a healthy balance between theory and practice, the book leads the reader from reaction mechanisms and kinetics to the technology of making furfural by various old and new processes, using conventional raw materials or sulfite waste liquor. Detailed discussions of means of increasing the yield are of great chemical and technological interest as well as of immense economic importance. From furfural proper, the treatise shifts to the fascinating field of wanted and unwanted by-products ranging from largely unutilized carboxylic acids to troublesome impurities such as 5-methyl furfural and 2-furyl methyl ketone, and then to extremely valuable serendipitous flavor compounds such as diacetyl and 2,3-pentanedione. A wide variety of derivatives are discussed; considerable space is devoted to polytetrahydrofuran, an important building block of stretchable synthetic fibers, while furan resins from both furfural and furfuryl alcohol are given the attention commensurate with their industrial importance. Notable supplementary chapters cover the in-line measurement of furfural, the treatment of furfural waste water, and various aspects of corrosion. A chapter on the applications of furfural elaborates not only traditional uses in extracting petroleum and vegetable oils but also the sensational discovery that furfural is a highly effective "indirect nematocide". Without becoming toxic, it changes the microflora of the soil by stimulating bacteria antagonistic to nematodes, thereby reducing the nematode population to zero, at an unprecedented low price. It is believed that this application will be the principal outlet for furfural in the future. A comprehensive list of physical properties, some never published before, make the book an indispensable companion for producers, users and researchers alike. For chemical engineers, major chemical companies, sugar mills, furfural plants, major plant design companies, and users of furfural and furfural by-products.